P-2673. 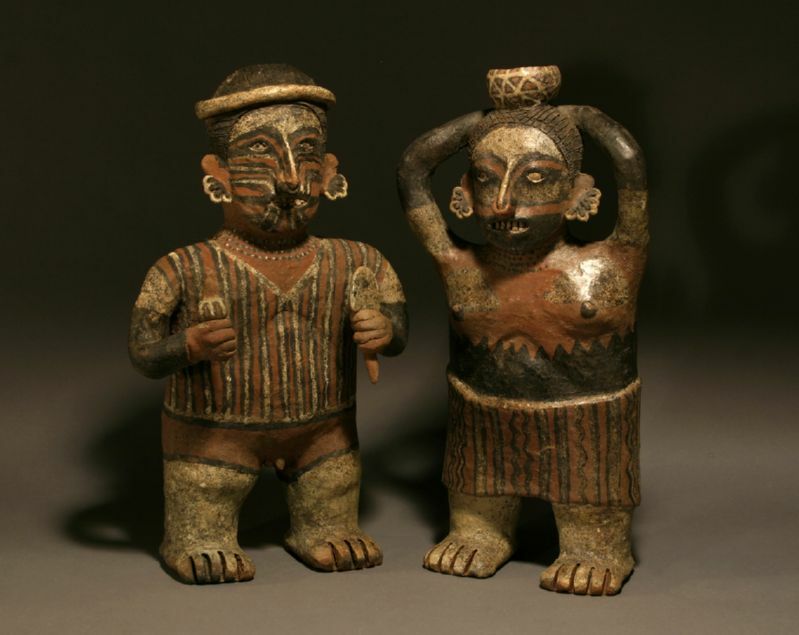 A SUPERB NAYARIT MALE & FEMALE POLYCHROME PAIR WITH GREAT ORIGINAL PIGMENTS. IXTLAN DEL RIO HIGHLY REFINED STYLE, PROTOCLASSIC, CA. 100 B.C. to A.D. 250. Provenance: Private Family Collection, Houston, Texas, formed during the 1960s. The female has masterful facial tattooing and wears a vibrant striped skirt. She holds a matching geometrically decorated bowl on the top of her head. She has a communicative expression with an enigmatic smile. The male also has incredible facial tattooing and a striped polychrome garment. He is holding a colorful rattle in the right hand, and a small axe in his left. The pigments are all original and in excellent condition.